I believe I've mentioned previously how I spent many of my Saturday mornings as a kid glued to the television watching cartoons, and how most of those were themed around comics or superheroes. 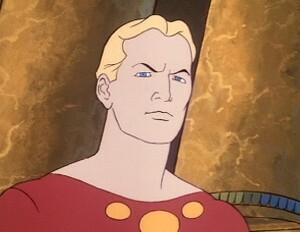 There were a few years when that included a Flash Gordon cartoon, that looked exciting and different from just about everything else on TV at the time. It also infuriated me to no end. The show was put together by Filmation after seeing the immense success of Star Wars. It was for Saturday mornings, though, so they did quite a lot to cut costs. Reusing generic footage, animating characters as silhouettes, that kind of thing. I recall it being noticeable as a kid, but not nearly to the extent that it was on later Filmation projects like He-Man. And they did something that no other American cartoon was doing at the time -- there was one story for the whole season. Each episode was merely a chapter in a broader story, and the credits always started running just as you were really getting into it. I thought that was fantastic. It seemed a lot more adult than the short, fifteen-minute adventures the Super Friends were getting into. The serial nature, while still fairly simplistic, meant that you had to follow for an extended period. There never seemed to be any condescension towards the audience, and the writers let the action unfold more naturally without a lot of unnecessary exposition. So why did the show infuriate me? Because the network never aired the episodes in order. At least not by the time I discovered it. It was very apparent, too, because the title of each episode was given up front with the chapter number. Oh, there was usually a quick summary of what happened on the previous episode at the start of each one, so it wouldn't take that much to follow along out of order, but I was so irked at that they weren't showing them in order in the first place, I didn't really bother to sort it out. I think I ultimately only watched a handful of episodes in total. Some decades later, I find the whole series is available for free on Hulu. I have to say that it really was an incredibly well-done series. It's not hard to spot the cost-cutting (not only re-using the rotoscoping from character to character, but I recall some of it being used in Filmation's Tarzan cartoon as well) but much of it was done very creatively to for dramatic effect. The spaceships in particular are fantastic. More significantly, the story holds up very well. It does have a number of those pulp-y plot coincidences -- owing a great deal to creator Alex Raymond's original stories -- but there's some interesting things going on. Character morals are rarely black and white, and the dynamics among them relatively nuanced, especially for a Saturday morning cartoon. I was happy to find it online to see if it held up as well as my imagination remembered it, and I was even more happy to see that my recollection wasn't even doing the show justice. It's well worth taking a look if you haven't seen it recently. I was also a fan of Filmation's FLASH GORDON -- and while I liked the cartoon a great deal -- I *LOVED* the animated movie FLASH GORDON: THE GRE#ATEST ADVENTURE OF ALL ... which cements Ming's alliance with Hitler. It's some strong, strong stuff.